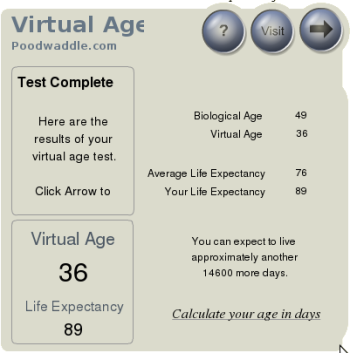 I did one of these on-line age calculation things today. I don’t really hold much stock in these sort of things normally as there as simply too many variable, hell I might get hit by a bus tomorrow. In this case though it goes through all the usual medical, hereditary and lifestyle questions that are idicators to eventual possible lifespan, so I was pleasantly surprised by my results. Yes I know this means nothing really but when you’re told you’re 13 years younger than you real age and you could live till almost 90 it’s a bit of a boost. In August 2005 it became illegal to demonstrate in and around Parliament Square without prior police permission under the Serious Organised Crime and Police Act (SOCPA). So far Maya Evans has been prosecuted and a number of others have been threatened with legal action. The law states that it only takes one person to constitute a demonstration, so the question arises , if every time a politician (including the PM) gives an interview in Parliament Square are the breaking the law? Mark Thomson the political comedian thinks so and has written to the Director of Public Prosecutions calling for an urgent investigation. Mark has also written an article in the Guardian (13th Dec) explaining. This is an absolutely crazy law which was used to get rid of Brian Haw, Maya Evans was prosecuted for reading the names of British and Iraqi dead at the cenotaph and people have been threatened with prosecution for displaying a cake with the word PEACE on it. Mark Thomas even had to get permission to where a red nose on Red Nose Day. If you hear any of the interview then send the details as well. Here are some other useful things you can do with Google that may not be immediately obvious. A Calculator: if you type a calculation in the search box, say (6*8)+5 and hit search Goggle will give you the answer. Exact Phrase: if you want to search an exact phrase then write it between quotes e.g. “css tutorials” or “css tutorials” for beginners. Weather: type weather Edinburgh or weather Adelaide etc. Site Specific: e.g. type photography site:wordpress.com will search for photography only on WordPress.com. 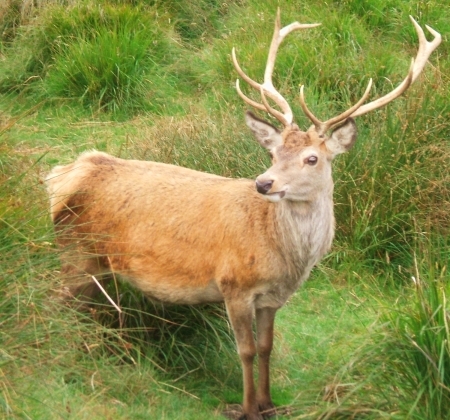 On a recent trip over to the Isle of Skye we stopped off at a car park on the A82 where we often stop to take in the view and stretch our legs, only this time there were a couple of red dear quietly grazing right on the edge of the car park. I’ve walked and cycled all over Scotland but this is definitely the closest I’ve ever got to these beautiful creatures. I’ve been bookmarking sites with lists of essential resources for some time now, some are lists of open source software, others to resources with hosts of information for web designers etc. All of them are useful and help you find resources and software you may not have previously known about. So this is a series of links to many of the lists I’ve found useful recently. 85+ Free Killer Resources Every Designer Should Know. From Mauricio Duque, a Colombian wed designer who has quite a few other lists worth a look. 45 Best Freeware Design Programs. More from Mauricio Duque. A huge collection of links to free (some open source) software. 101 Essential Freelancing Resources. Actually 126 at the last count nicely categorised with something for every freelancer out there. A huge list of on-line generators from Smashing magazine. I have a huge number of cassette tapes which have been languishing in a box unplayed for some time now. I always knew it was possible to digitise these and I had all the tools, but getting round to actually doing it was another matter. This is a simple run down of what I did. First the tools, if your PC sound card accepts external inputs (most do) then just connect any tape player (or LP player). In my case I used an old Sony Walkman. 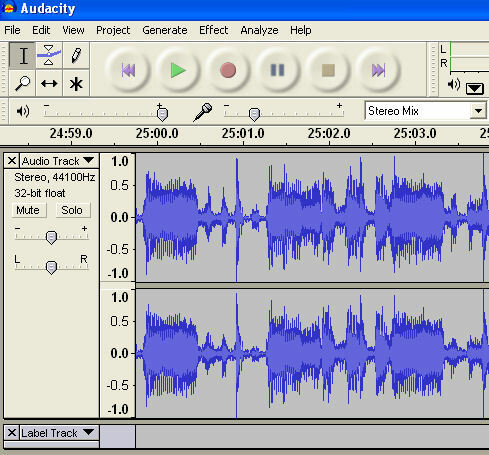 The software I used was Audacity, an open source cross platform sound editor. 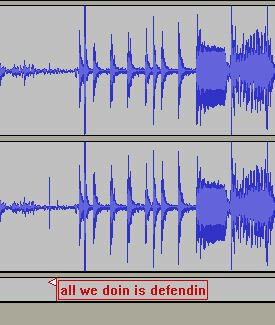 Since Audacity does not encode mp3s I also downloaded the Lame mp3 encoder. I set the preferences under Edit>Preferences to 2-channel stereo and 32 bit float quality, then selected the source to stereo mix and adjusted the input volume to 0.2 to get maximum volume whilst avoiding clipping. With these basic settings all I had to do was insert a tape, hit play, click record in Audacity and leave for 45 minutes (one side of a C90 tape). Now I had to chop the single track into individual song tracks and there’s an easy way to do this with Audacity using a label track. Place the cursor at the start of a track and select Project>Add Label at Selection (or Ctrl-B). This produces a label track below the two stereo tracks with a red flag at the cursor which you can type the track title next to. Continue doing this for each successive track remembering to cut any long sections of noise between tracks. Now to export the entire project, select File>Export Multiple, this opens up the dialogue to select the format and location etc. You can then type the artist and album data which will be tagged to each mp3 file and will end up with all the individual mp3 tracks being save in the chosen directory. 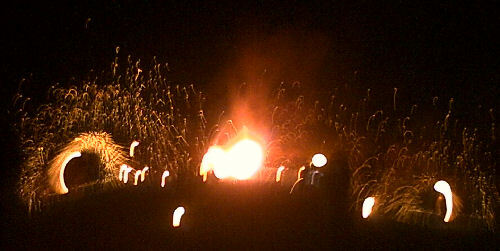 Just back from the Wickerman Festival, a sort of laid back early Glastonbury, less commercial sort of affair. There were no real big names playing unless you count the Fun Lovin’ Criminals (who we missed) and the Proclaimers (who sadly we didn’t miss) and the Orb. The highlights for me were the Peat Bog Faeries who were excellent on the main stage and a few good bands who’s names I forget in other tents, especially the acoustic tent. The festival is loosely based around the Wickerman film which is shown on a small outdoor cinema each night and culminates with the burning of a giant Wickerman. At my age there’s not many places I’d feel comfortable dancing to ‘rave’ music but at this festival it seemed natural and I had a great time dancing with my wife and daughter. Perhaps it’s because your virtually outdoors all the time that makes people less inhibited, or maybe it’s because everyone else is doing the same sort of thing. There were inevitably some characters who went out of their way to give others a good time, I particularly liked the dark Spider Man especially when he was being hoisted aloft the crowd at the main stage. There were also a couple of guys who provided a few photo opportunities dressed as Frank-n-Furter from the Rocky Horror Show, I don’t know how they managed the soft grassy field in those heels. 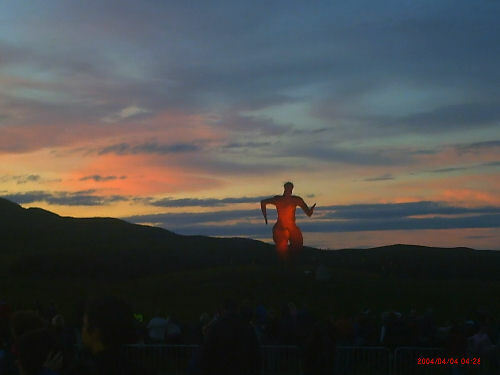 On the Saturday night we hung around the top of the hill so we could see the Wickerman, we were quite a way from the main stage but unfortunately we could still hear the Proclaimers, fair go to them for building a career on one hit song but I really can’t stand them. 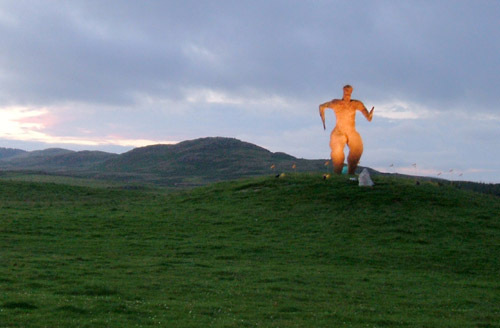 At around 23:40 my daughter and I went to the toilet…bad idea, by the time we got out it was wall to wall people gathered to see the Wickerman go up in flames, it was just luck that we managed to bump into my wife again. The show started with fire juggling with giant poi which was pretty impressive but I had to laugh when two cyclists on burning bikes cycled round the Wickerman in opposite directions, what mad genius came up with that idea? I did notice they got off the bike pretty sharpish after riding round the front of the Wickerman. 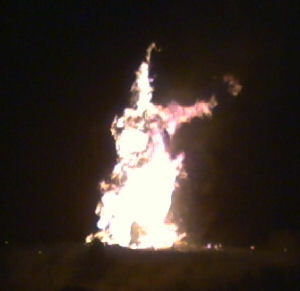 Then the Wickerman itself went up slowly at first then into a giant running man shaped inferno. What is it with people an fire, we all seem to be totally fascinated by it and any show involving fire draws a crowd. It was all over pretty quickly though and the night was rounded off by watching some poi jugglers practising and listening to the Axis sound system from London. I think I’ll be back next year. Got tickets for the Shins gig in Glasgow on Sunday, they were sold out when I found out about the gig but I managed to get a pair on Ebay, paid a bit over the face value but not much. For some reason the venue has been chaged from the ABC to the Barrowlands, I’ve never been to the Barrowlands so don’t know if it’s any good, looking forward to a great gig though. Well we finally received notification from the National Trust for Scotland that our application to live on the Isle of Canna was not successful. Apparently they received over 500 applications from the UK, Europe and from as far away as Australia. I will be interested to see who is finally chosen though. Some time last year we heard that the National Trust for Scotland were looking for families to live on Fair Isle, one of the islands owned and managed by NTS. We thought about it long and hard but in the end decided Fair Isle was perhaps a little too remote, even for us. Since then we have often talked about moving to the western isles, possibly Skye and have looked at many properties. Then last Sunday I bought the Sunday Times, which I havn’t done for ages and there was an article about the people who had moved to Fair Isle last year. In addition there was information that NTS were going to be looking for two families to live on another of their properties, the Isle of Canna in the inner Hebrides, a small island to the south west of Skye. We are not fooling ourselves that this will be easy or in fact we will get selected as we know there will be a lot of applicants but we are hopefull and have sent for the information pack and application forms, so keeeping fingers crossed.